Welcome to Michelle Russell's site! For the last decade and more, singer Michelle Russell has been taking her specially created cabaret shows to audiences of all kinds in Pennsylvania, New Jersey, Tennessee, Minnesota and, of course New York City. Among the shows Michelle has performed are: "The Three Blondes: A Tribute to Doris Day, Peggy Lee and Marilyn Monroe," "Tribute to Rosemary Clooney," and "Tribute to the career of Julie Andrews." Below are three clips from a guest appearance, NYC June 2010. These clip's are from Michelle Russell's one night return to NYC with her triumphant show "The Three Blondes" in NYC! The show is a tribute to Peggy Lee, Doris Day and Marilyn Monroe, with songs and commentary. Michelle is available on Apple itunes!!!! Click Here! 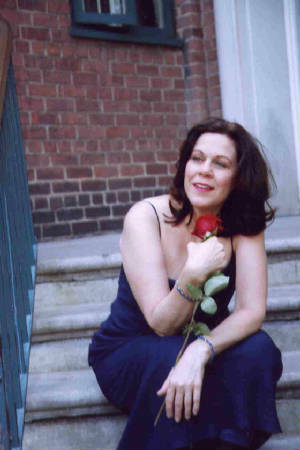 Michelle Russell is a New York City cabaret singer, who brings back the glamour and romance of yesterday with her renditions of Big Band and the American Songbook hits. Michelle Russell has performed from New York City to California and in-between in New Jersey, Pennsylvania, Wasington, DC, Maryland, Virginia and Tennessee. Purchase a copy of Michelle Russell & The Moonlight Band for $7.00 plus $2.25 postage & handling. Be sure to scroll to the top and visit Michelle's other pages listed there! Thank you for visiting! Please come back again! 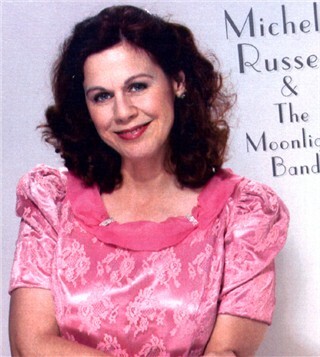 Recorded in 2001, Michelle Russell & The Moonlight Band is a six-song CD, available for purchase on this site or at CdBaby.com. (Please see link above). To visit Michelle's favorite accompanist and songwriter, Bennie Martini, click here! This counter doesn't work. From 400, it went down to 2... We shall try again, but pay no attention to small numbers!